Oshkosh Bird Fest, Oshkosh’s newest event, celebrates International Migratory Bird Day on Saturday, May 7 with a variety of activities for all ages and everyone interested in birds. Most of the activities will take place in different locations at Menominee Park from 6:00 am - 2:00 pm. Visit the Kiwanis Shelter for a complete schedule and directions. In addition, there will be three yard tours hosted by Wild Ones members from 10:00 am to 2:00 pm. Then, visit downtown Oshkosh for Gallery Walk from 6:00 pm to 9:00 pm, which will feature local bird photographers and artists, an author, and live birds of prey. The day will begin with a “Big Sit”, a unique way to bird watch (founded by the New Haven (CT) Bird Club). Join Anita Carpenter inside the 17-foot diameter circle for the Big Sit anytime from 6:00 am until Noon for as long as you want. Bring a chair and enjoy watching, listening, counting and learning about birds that you see and hear. This is sometimes described as “a tailgate party for birders”. Anita, an Oshkosh resident, is an avid birder and naturalist. She contributes articles to Wisconsin Natural Resources magazine and has a regular column in the Winnebago Audubon Lake Flyer newsletter. From 8:00 am – 2:00 pm, you will find informative exhibits at the Kiwanis Shelter covering bird migration, landscaping with native plants, glacial habitat restoration, eagle/osprey surveys, county parks, and more. You won’t want to miss the presentations with live birds of prey at 10:30 and 12:30 by Beka Weiss of Aves Wildlife Alliance. Learn all about why and how bird banding is done from a licensed bird bander. Knowledgeable birders will be stationed in different locations to view the birds on Miller’s Bay and the island, plus visit the purple martin colony by the waste water treatment plant to learn about these special birds. Also scheduled is a tree planting demonstration by City Forester Bill Sturm in the Zoo from 10:00 am—Noon. And at 9:30 am attend the Bird City Wisconsin dedication ceremony near the Zoo entrance. The Oshkosh Zoological Society will host educational and fun children’s activities from 10:00 am – 2:00 pm. in the zoo. Children will make their own binoculars, then go on a bird walk and learn to identify birds. We will also be “banding” kids in an exercise to show them how birds are caught, processed and banded for research. Birds have different kinds of beaks and the children will be able try to eat like a bird using different tools. Wild Ones Fox Valley Area members will host three yard tours in Oshkosh from 10:00 am – 2:00 pm. Pick up a map at the Kiwanis Shelter. These yards are landscaped with native plants and the homeowners will share with you how they made their yards more bird and nature friendly. The bird theme continues into the evening at Downtown Oshkosh Gallery Walk from 6:00 pm – 9:00 pm. Apple Blossom Books will host Mariette Nowak, author of “Birdscaping in the Midwest”. Mariette’s book will be available for purchase and signing, plus she will have a colorful slide show of her yard and birds playing all evening. Take this opportunity to ask questions and discuss with Mariette what you can do in your yard for the birds! Winnebago Audubon and Wild Ones will also be on hand. Several other downtown stores will feature bird art including: Art Haus - Mike Briley (photographer), Bergman’s Fine Jewelry - Michael Huebschen (photographer), Christensen’s Lingerie - Pat Fischer (rehabilitator withlive birds), Crescent Moon Antiques - Frank Zuern (bird carver), Gilded Lily - John Van Den Brandt (photographer), Klassy Kids - headbands for kids, Limelite Studios - Boyd Gibbs (photography), Market Street Boutique - Green Sweet Crafts (bird houses and feeders). Oshkosh Bird Fest was planned by a committee of people who have a passion for birds and a healthy environment with affiliations to Oshkosh Bird Club, Oshkosh Zoological Society, Wild Ones Fox Valley Area, Winnebago Audubon Society, Winnebago Lakes Council, and Wisconsin DNR with support from the City of Oshkosh. The concept for a Bird Fest came from Bird City Wisconsin. Oshkosh was recently recognized as a Bird City for 2011, after submitting its application and successfully meeting the criteria outlined. Our city proved that it not only can implement sound conservation practices on their own, but it can educate its residents to play an increased role in making our community healthy for birds . . . and people. Bird City Wisconsin is a coalition led by Milwaukee Audubon Society, the Wisconsin Bird Conservation Initiative and the Wisconsin Society for Ornithology to ensure that Wisconsin’s city folk maintain healthy populations of birds and grow an appreciation for them. With funding from TogetherGreen, an alliancebetween National Audubon Society and Toyota, the program addresses an increasing problem: the decline of urban bird populations. Bird City participants will learn how to protect and manage greenspace; landscape with native plants in backyards and parks; adopt architecture and lighting systems that reduce bird collisions; and making our community hospitable to breeding, wintering, and migrating birds that seek safe places to spend time and find food. Check out the Bird City website at www.birdcitywisconsin.org. Oshkosh Bird Fest is free and open to the public. For more information about the first annual Oshkosh Bird Fest, visit www.winaudubon.org/calendar, or contact Janet at wiss@centurytel.net or 920-589-2602. Opportunities to volunteer or provide financial support are available. See all City of Oshkosh News & Updates here. Do you have any other previous experience, special qualifications, or technical training that would be relevant to the position of city council member? As a member of the Winnebago County Board I have experience in government, budgeting, infrastructure, etc. I serve of several boards and committees that deal with similar issues to the Oshkosh Common Council. These include ADVOCAP (Treasurer), Winnebago County Information Systems Committee (Chair), East Central WI Railroad Consortium (Secretary). We are in very difficult times for local government. I believe that we need to seek new, creative ways to deliver services while preserving the quality of these services. I want to see Oshkosh move forward in these difficult times, not fall behind or stand stagnant. I will add a creativity and openness to new ideas while still defending the integrity of our local government. I believe in the mission and responsibilities of local government, and the City of Oshkosh. I will work to advance both. I ask the Oshkosh Common Council to consider my application for this open seat. The recount of the April 5, 2011 City Council Election finished this past Wednesday, April 20, with a draw of the cards and affirming the election of Tom Pech, Jr. as Councilor Elect. We are satisfied with the results and the process of both the election and recount. We thank the poll workers, city staff (with special thanks to Pam Ubrig and Lynn Lorensen) and volunteer observers that worked on the recount. From the beginning we believed the city election processes are correct, and the recount proved this to be true. The recount was requested so that all votes properly cast were counted. Both of us agreed that the process would not be adversarial or contentious. As such we reviewed each other’s votes and had opportunities to pull each other’s votes for hand counting. Several times one of us would pull a vote for the other to assure that it was properly counted. In the end the recount resulted in a rare tie on the final tally. (c) The candidates may, if all those tied for the same office are present, draw for themselves. The Board of Canvas determined the lot, a draw of cards. A new deck of cards was opened and the seal broken with the deck shuffled multiple times by Pam and then by two members of the Board of Canvass. The cards were “washed” on a table, with our backs turned and then the cards were drawn. As the candidates involved in the recount, we would like to affirm that we believe this was the best way to settle the tied election. We would also like to remind Oshkosh citizens that your vote counts. Every vote cast in this election mattered for the outcome. It also affirms the processes of the election and recount. Please vote, your vote does truly count! 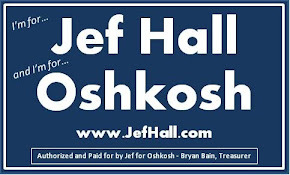 An election tie that had to be resolved by drawing cards to win a seat on the Oshkosh Common Council should be enough to make Jef Hall the clear front-runner for appointment to the seat vacated as a result of Burk Tower's election as mayor. I don't expect it to go that long, but I would like to line people up. Tom & I have been pulling each others ballots as they appear they might not scan - that is all we are interested in. 1. Allow the canvassers to count and reconcile ballots. 3. The pulled ballots are hand counted while the others are run through the machine. 4. Numbers are reconciled and recorded. 5. The next ballot bag is opened. And the process is repeated. All of the Common Council Candidates agreed to accept the results of the election except for the Peck/Hall race. This means the board of canvas can declare Poeschl & Allison-Aasby as elected. 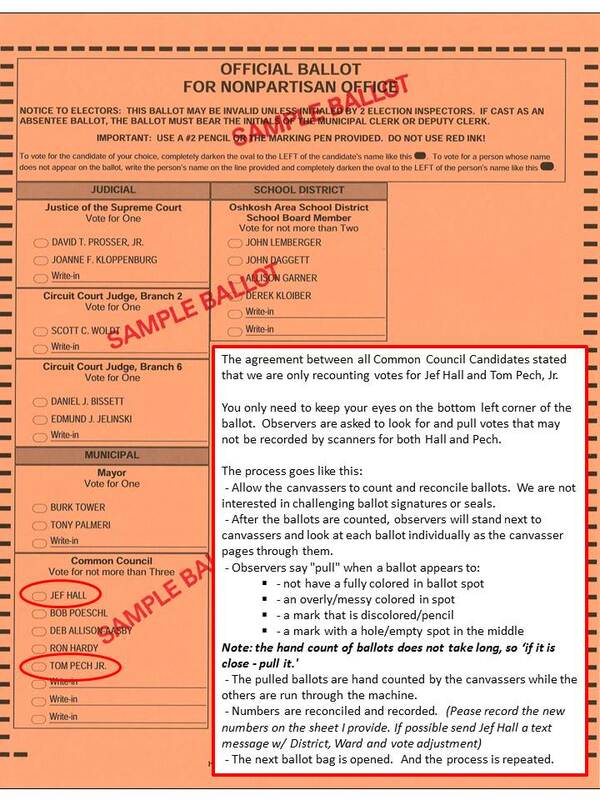 - We are only looking at ballots w/ votes for Hall, Pech or both. 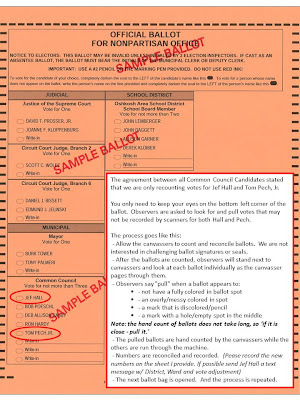 If a ballot seems as though it may not have registered on an OS (scanner) machine, but did not contain a vote for Hall or Pech, it will not be seperated for hand-count. If we would have chosen a few wards, I could not have asked for more as I understand. However, Mr. Pech could have if the totals changed. It was an idea to save some money potentially. I did find it odd when you compare touch screen use to ballot use - the number of votes for council candidates per vote for a mayoral candidate is different, with a higher proportion with the TSX machines. this does suggest that there are votes run through the OS machines that do not get counted. And we have seen ballots with check marks or incomplete ovals filled in to see why this happens. We are not quite done with District 1, so an update will be coming in a bit. It is a large district with about 8% of all the votes to be re-counted. I need some people to help with my re-count. They assume it will take 4-6 days, and I can only have 1-2 days off work. Please spread the word. If you or a reliable friend are available any morning or afternoon (or all day) Wednesday (tomorrow) thru next Friday (4/22) and could look at ballots for my name, please let me know. This is not going to be a contentious recount, we are merely trying to make sure all votes cast are counted, not disqualifying votes for others. I recently posted my recount petition. a. That Petitioner’s investigation into potential errors in voting and vote counting in several Oshkosh wards is incomplete at the time of the deadline to file this petition. To ensure the integrity of this and future elections, investigation into potential mistakes in voting process need to be investigated. The recount procedure is the current best tool for this investigation. Explanation: The recount must be asked for within 3 working days of the close of the canvas. Oshkosh's canvas was closed on Wednesday, this means that if there was to be a recount, it must to be requested by 5 PM today. I had requested information from different sources, and was still looking into others, but because the information was not yet received, a decision had to be made. b. Petitioner has discovered the TSX Direct Voting Machine in Oshkosh District 5, Wards 9 and 10 registered 0 votes for any candidate. Petitioner has indirect evidence of votes cast on this machine before it was put out of service. When the TSX Direct Voting Machine in Oshkosh District 5, Wards 9 and 10 was put out of service, this represented an unequal voting opportunity for this location. Several neighboring polling districts cast over 20% of their votes on similar devices. That Petitioner received an 8% higher portion of votes received cast on TSX Direct Voting Machines. There are large percentage swings by district in the use of the TSX Direct Voting Machines. Explanation: I received results from Pam Ubrig, Oshkosh City Clerk that were broken down by machine type, ward and candidate. These showed that wards 9 and 10 had zero votes recorded on the TSX (touchscreen) voting machines. Fellow candidate for the Common Council and occasional poll worker Ron Hardy votes at this location. I checked in with him to see if he knew of any votes cast on this machine. He said he thought a neighbor had voted on the TSX. I have not confirmed this, but I was under the deadline outlined above. Looking at the results by machine, I received 60 votes more via the TSX machines (ironic given my previous opinions on these units - which has not changed) while Tom received 74 more votes via paper votes. If the percentage of votes was even from both machine types, it would have meant 128 more votes. c. There were votes cast on paper ballots that were not countable through the regular process in Oshkosh District 15 after the supply of ballots was depleted. These are not normally able to be counted in the current defined election process. Ward by ward votes cast by machine type for the county-wide races, as was provided by the Oshkosh City Clerk. This would be used for further comparison and investigation for voting patterns or errors. Process and effect of the vote tally change in the Wisconsin Supreme Court election from election night to canvas completion. Petitioner requested vote totals by: wards, candidate, and machine type before and after the canvas as well as a description of the process that led to the discrepancy. Petitioner believes this information would lead to an evaluation of the voting procedure for the county, lending to a greater confidence in this process. I have requested the same information from the County Clerk as I received from the City Clerk. I have not received this yet. Part of this is because of the short time frame available. Wherefore: Petitioner requests a recount of all wards within the City of Oshkosh. Dated this 11th day of April, 2011. I, Jeffery C. Hall, being first duly sworn, on oath, state that the matters contained in the above petition are known to me to be true except for those allegations stated on information and belief, which I believe to be true. Subscribed and sworn to before me this ___________ day of ______________________, ________. The information on this form is required by Wis. Stat. § 9.01. This form is prescribed by the Government Accountability Board, 17 West Main Street, Suite 310, P.O. Box 2973, Madison, WI 53701-2973, (608) 266-8005. Oshkosh Schools Lead the Fox Valley!